Most children have an innate desire to mimic their parents. This is especially true in the kitchen. With the proper instruction and practice, children CAN do most everything adults do. Turning their motivation into teachable cooking moments sets the foundation for a lifelong healthy relationship with food. Even young kids quickly become truly helpful cooks. In this busy age, having a child who is able to assist making meals and make themselves a snack is a time saver. Beyond helpfulness to you, allowing children to contribute raises their self confidence. They are more likely to eat foods they have helped prepare. Think of years later when kids who cook age into college students able to feed themselves well. We teach by modeling first, then working together, and finally allowing independence. One of Lillian's favorite tasks is to help chop fruits and vegetables. At first she was allowed to use a plastic knife, then metal butter knife, and has now graduated to a paring knife. Yes, my just four year old uses a paring knife, the same paring knife Alex sharpens regularly. When teaching children any lesson in life, it is necessary to give them the right tools. It makes sense to me that if a child can exhibit self control and wants to cut a tomato, a butter knife is not going to do the job. Of course, we maintain some basic precautions. Knives are stored out of reach so they may only be used when an adult is around. If Lil is in an angry or wiggly mood, we help her find a way to be calm before helping in the kitchen. 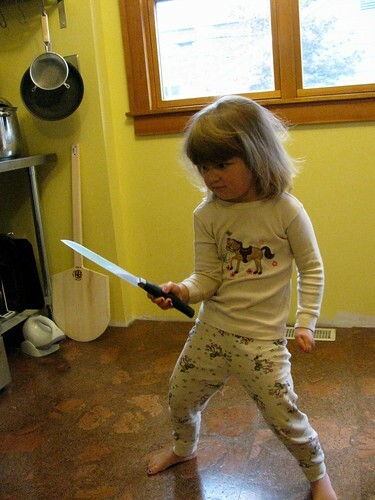 If she gets too excited about chopping and begins to look unsafe, we substitute a different knife or ask her to come back later after she has spent some energy. "But what if she cuts herself?" aunts and grandparents ask when they see her with a sharp knife. "What if?" I answer. Given her lack of strength, it is unlikely she will do permanent damage if she slices a finger tip. Adult cooks, even professionals, cut themselves often. Lil is well acquainted with the story about when Alex self amputated a bit of his thumb while chopping onions. Practicing now under supervision is as good a time as any to begin knife skills. 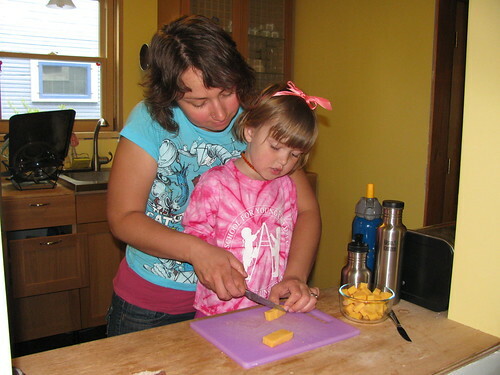 With freedom and her sharp knife, Lil has grown to become a great assistant in the kitchen. I give her cloves of garlic to chop and she does it happily. She can chop apples for sauce, cut cheese in chunks, de-seed tomatoes, quarter mushrooms, and more. I say, let children use knives. Model good knife skills and allow them to practice under supervision. 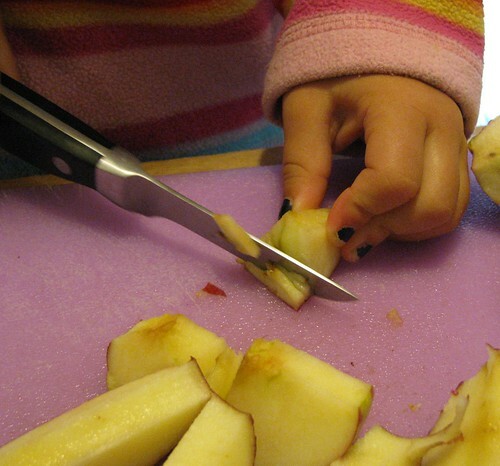 You will not only give your children a life skill, but get some relief from chopping all those ingredients yourself!